Are holes required to install the Pickup Tuck? Pickup Tuck does not require you to drill holes in the truck bed and will not cause any damage to the truck bed that would violate your truck lease agreement. Can I lock the Pickup Tuck? Pickup Tuck is locked when the tailgate has been closed and locked. The design of the Pickup Tuck locks the unit securely in the truck bed when installed. Closing and locking the tailgate secures the content in Pickup Tuck. How is the Pickup Tuck different from the other truck cargo/toolbox options? + The Pickup Tuck provides accessibility from the tailgate. + Folds for storage and easily stows in the cab when not in use. How much weight will Pickup Tuck Support? Pickup Tuck has been weight tested for 300 lbs. Is Pickup Tuck easy to install? Pickup Tuck only weights 25.5 lbs. and can be easily handled and installed by women or men. Is the Pickup Tuck durable and secure? • Durability – The Pickup Tuck panels are constructed of high-density polyethylene (HDPE) which is a corrosion-resistant material used in swimming pool installation and outdoor play structures for children. • Security – Once the top panel structure is installed over the vertical panel structure, the support strut is swung out from the top panel engaging the vertical structure locking the two structures thus providing significant security when the tail gate is locked. Is the Pickup Tuck portable? 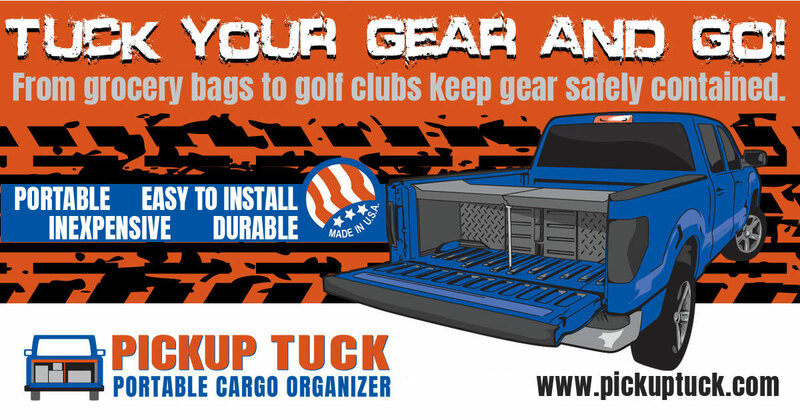 Pickup Tuck can be easily removed and stored in the truck cab or garage when not in use. It allow you to retain Flexibility to haul cargo of any size your truck be will allow. Is the storage compartment provided by the Pickup Tuck water proof? The design of the Pickup Tuck provides water resistance from the top panel structure and all vertical structures. However, since the truck bed incorporates ridges to facilitate water drainage toward the tailgate, water can be present on the floor of the storage compartment. An accessory floor mat will be available to address this potential water exposure. What colors can the Pickup Tuck be ordered? Pickup Tuck is only available in Black. What is Pickup Tuck made of? 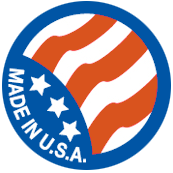 Pickup Tuck is made of Manufactured From High-Density Polyethylene (HDPE). HDPE will protect panels from exposure to sun, rain and snow. What is the warranty on these products? Your new Pickup Tuck Portable Cargo Organizer will come with a 1 year warranty that completely covers against any defects in materials or workmanship. What truck bed modifications are required for installation into my vehicle? None. Completely portable. Shipping weight only 25.5 pounds. Will Pickup Tuck create Vibrations or Noise? Pickup Tuck has been tested for Noise, and Vibration. It will cause no more noise that you hear with an open pickup truck bed and the tailgate up and locked. Will the Pickup Tuck fit my truck? I have a tonneau cover. Purchasers are encouraged to compare critical dimensions shown for the Pickup Tuck against actual dimensions of their pickup truck bed to ensure custom fit. The Pickup Tuck can be accommodated with most tonneau covers and will not interfere with cab-ward mounted tool boxes.